But first, a few details about this launch: Dior initially announced the release of 44 new shades in September, but not all are currently available in the US, the rest are supposed to be added to the range soon (I counted 33 on Nordstrom's website and 38 on Dior's). There are 3 different finishes in the range: Flash, supposedly intense, pure colors, Glow, the glossiest, pearl finish, and Glitter, well, with glitter. Unfortunately, there's no way to know which shade comes in what finish when you shop online, and in my experience, the testers in store displays get mixed up so it's hard to tell in person too. The names and shade numbers are no help either! If you have a link to a color chart showing the finish for each shade, please share it in the comments! 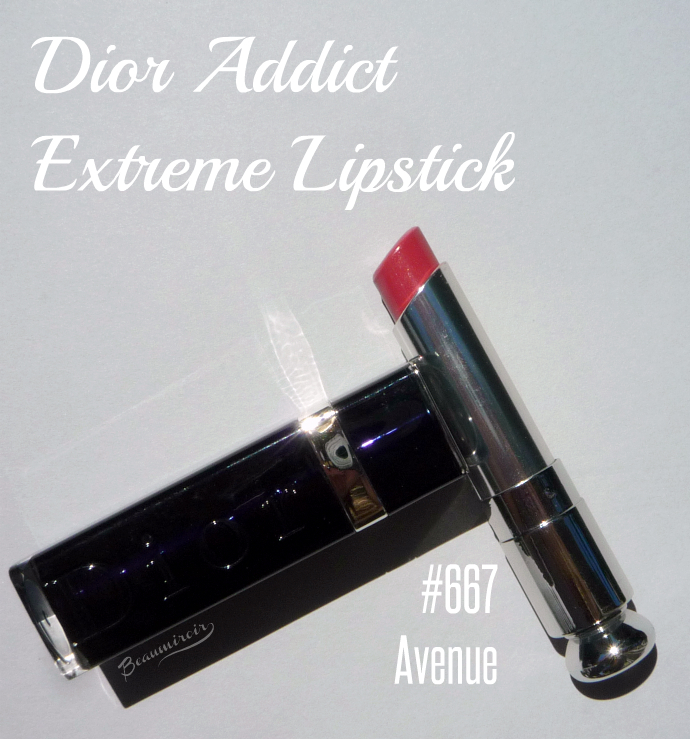 When revamping their most popular lipstick, Dior decided to do away with the Addict Extreme Lipstick version. 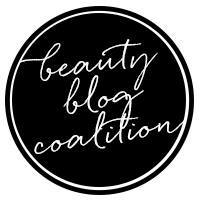 A much loved formula, the Extreme was glossier, more pigmented, and supposedly longer-wearing than the regular Addict. Of course many of us were disappointed to lose such a great lipstick, but word came out that the Flash finish was similar to the old Extreme (I heard it from Mostly Sunny first). 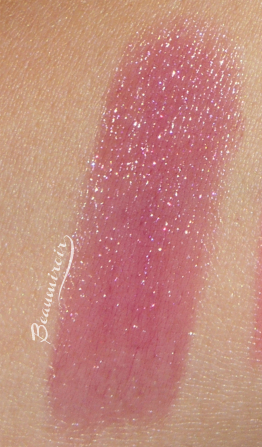 While it's hard for me to say if the 2 formulas are really dupes (since I couldn't figure out which shades had which finish when swatching), I made a little test: I swatched Avenue in the store, which I believe is a Flash shade (no glitter, no pearl), to compare it to the old Avenue Extreme I reviewed recently. While the color was very similar, the new Avenue appeared slightly less pigmented. 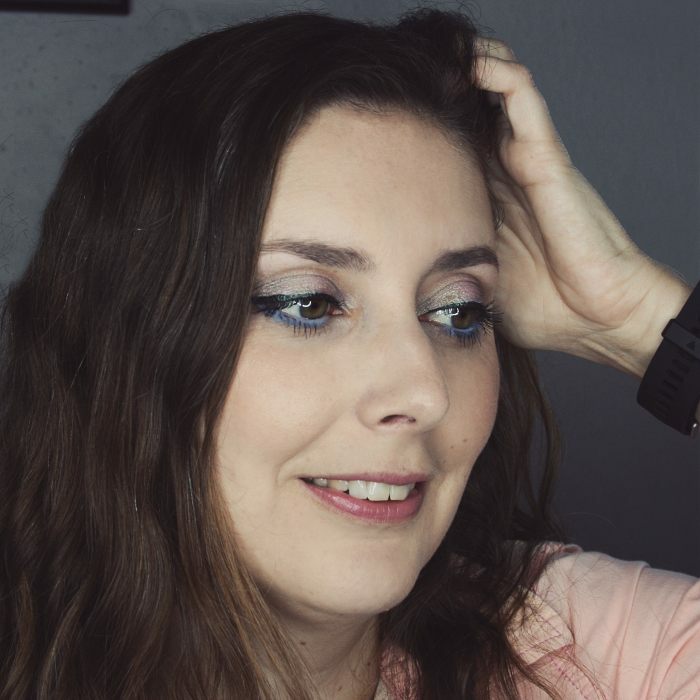 My first impression of the new Addict lipstick when I started seeing online reviews by bloggers who received the PR samples was major disappointment: it looked incredibly sheer, like a barely there, almost transparent glossy balm. I'm happy to report that not all the shades are that sheer! 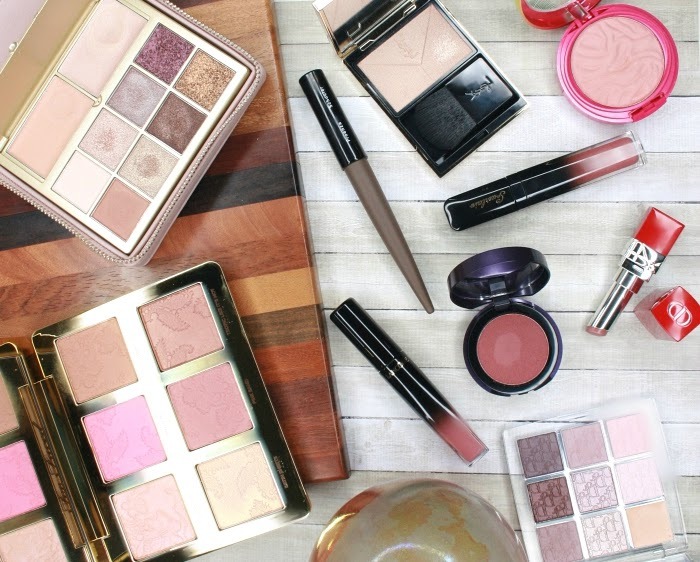 What's interesting is that Dior sent out the same small selection of shades to all bloggers, and for some odd reason they mostly picked extremely sheer colors, with one pinky red that looked a little more intense (Tribale, Wonderful, Smile and Be Dior). Bizarre choice if you ask me, because if it's true that a large portion of the shade range is made of light, super sheer nudes/peaches/pinks, there are also bolder, deeper and vampier colors that show up much, much more than these few transparent shades they promoted. 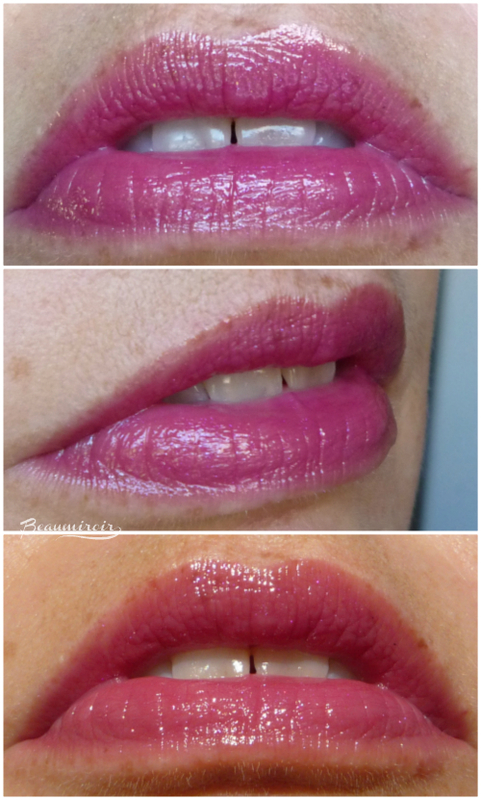 So, after much discussion and personal tests, here's my general opinion of this new launch right now: I think it's a great formula but there are way too many light, sheer colors in the range (most of which are completely indistinguishable on lips), and a bit more pigment overall would have been a great idea. The main difference between the new Dior Addict and the previous version is the "hydra-gel core" that's supposed to yield a "top coat effect". The CD monogram on the bullet itself runs the full length of the lipstick, and it's made of oils and other emollient ingredients for a moisturizing effect and high shine finish. 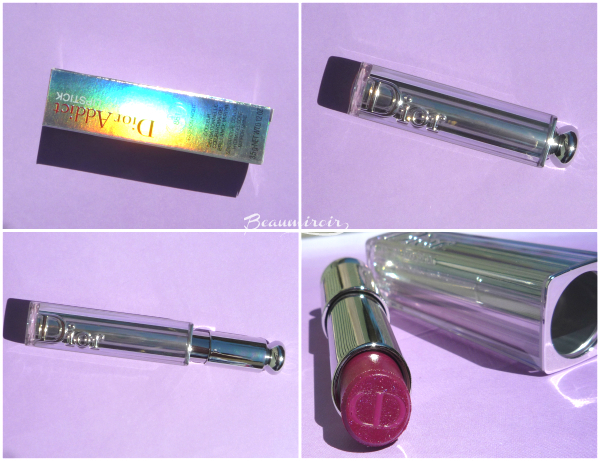 You may remember that Dior released Addict lipsticks with a monogram of a different color with the summer Tie & Dye collection. Here the initials are more or less the same color as the rest of the lipstick and just add shine, and supposedly comfort and lasting power. I bought a shade called Fashion Night, a warm plum with silver, pink and blue shimmer (because who can resist blue shimmer?). The shimmer looks pretty subtle once applied: it's a very reflective shade but I don't think anyone could detect the blue shimmer from a normal distance. The texture of this unscented lipstick is very thin, it feels like a wet, slippery gel and it glides on the lips effortlessly. I can feel the sparkles a little bit while I apply it or if I rub my lips together, but it's not so gritty that it becomes uncomfortable. Fashion Night looks pretty sheer with just one swipe, but luckily it can be built to semi-opacity very easily. It always remains translucent, but you can get a nice intensity by layering. 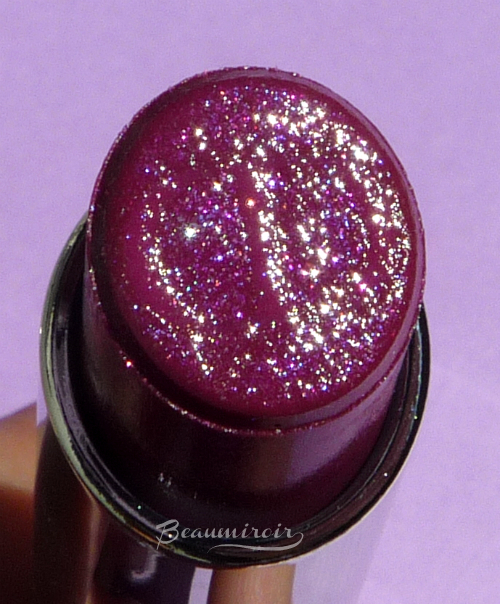 The finish is very glossy with this shade, it has a "wet lip" effect that really attracts attention. It's very comfortable to wear, it feels lightweight and never sticky or tacky. It does seem to bring me a little bit of moisture, since my dry lips don't get parched throughout the day. The wear time is a lot better than I expected for such a light, glossy formula: it goes through a few cups of tea and small snacks without loosing much intensity or shine, and if I don't eat, it will last a half-day easily. 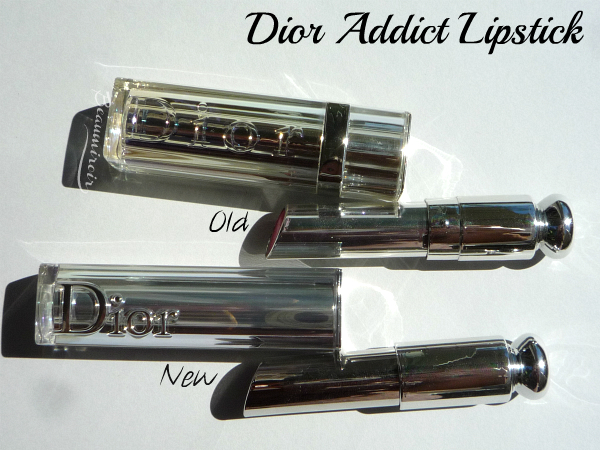 I did a few shots so you can compare the new vs. the old Dior Addict Lipstick. 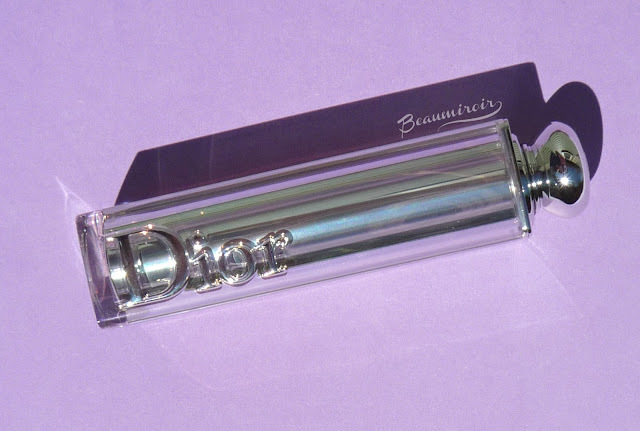 The packaging remains very similar, Dior just modernized it with a slimmer tube and a magnetic closure (not a fan, the "click" doesn't sound very luxurious). 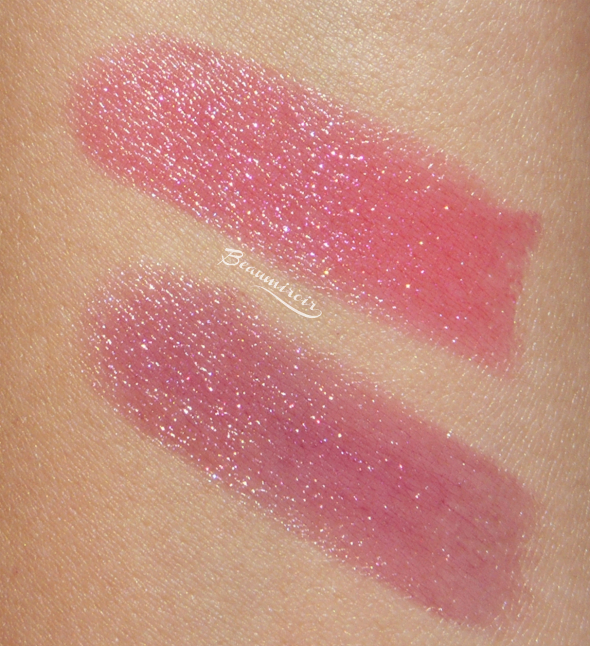 I swatched Fashion Night next to an old LE shade called Reflet, because it also happens to have the same blue shimmer. The two shades are obviously different, but the shimmer is absolutely identical, and they have more or less the same level of shine. 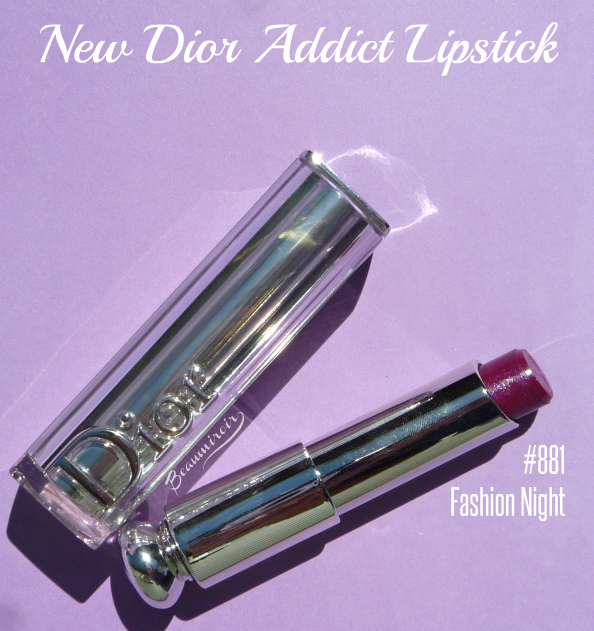 The new Addict feels a bit lighter and glides a bit better, but it's also a tad less pigmented. 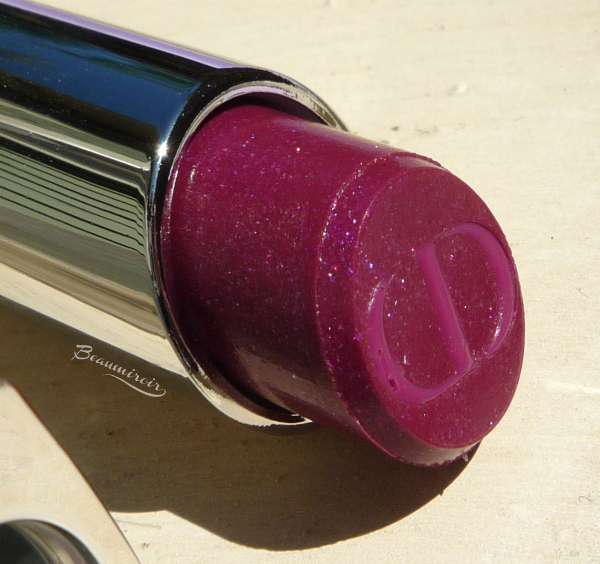 Overall: although I'm not completely sold on the new Dior Addict Lipstick formula because of a general lack of pigmentation, I do recommend the deeper and bolder shades like Fashion Night, a lovely plum for fall. These shades have a nice level of intensity, and the lightweight, glossy formula is both comfortable and longer-wearing than your average shiny lipstick.